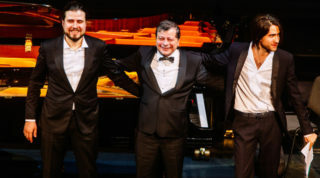 Georgijs, Sergejs and Andrejs Osokins, collectively known as the Three Osokins, are three of the most distinguished and accomplished piano players in Latvia. Father Sergejs, as well as two sons Georgijs and Andrejs, have been performing together since 2015, both as a trio as well as with orchestras. All three have been awarded the Latvian Great Music award (Sergejs in 2004, Andrejs in 2008, and Georgijs in 2015). To commemorate Latvia’s 100th birthday in 2018, all three recorded works for solo piano by Latvian composers. 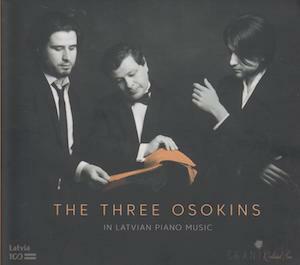 The CD, entitled The Three Osokins in Latvian Piano Music, was released by the Latvian national record label Skani as part of the Latvian Centenary series. The album collects piano works written throughout Latvia’s history to, as the artists have stated, “show our country’s music in all of its splendor and diversity”. The youngest Osokins, Georgijs, performs two works by composer Pēteris Vasks – ‘Vasaras vakara mūzika’ and ‘Baltā ainava’. Like many other Vasks works, themes of nature are woven throughout these pieces, and Georgijs provides the necessary dramatic flourishes, with moments of calm and tranquility balanced with mysterious and ominous elements, particularly in ‘Baltā ainava’, with its wintry scene that is at times full of wonder, but at other times there is an uneasy tension, and Georgijs provides a vivid portrayal of this chilly vision. Sergejs Osokins performs works by Jānis Zālītis and Jānis Ivanovs for his contribution to this collection. Zālītis’ piano compositions are not as well-known as his songs for choir and solo voice, but, in the hands of Sergejs, these piano pieces (all of which are brief miniatures) reveal a similar kind of lyricism and musical flow that are in Zālītis’ choir works, such as the playful ‘Mazurka’ or the appropriately sentimental ‘Reminiscence’. The works by Ivanovs are two sets of preludes, the first set from the early 1950s, and the second from the late 1970s. The early 1950s were an era of severe repression in Latvia, and artists needed to express a kind of ‘socialist realism’ in their works – a need to express how genuinely ‘happy’ everyone was in the Soviet Union. However, even with these artistic constraints, Ivanovs was still able to create memorable piano compositions that, in Sergejs’ performance of them, are lively and energetic. Sergejs contrasts these with the later preludes, composed near the end of Ivanovs’ career, which are more somber and have a kind of resignation about them, and provide for a fascinating comparison with the earlier preludes. The most recent composition on this collection is Artūrs Maskats’ ‘Kazbegi: Tsminda-Sameba’, which was actually dedicated to Andrejs Osokins. The work, inspired by a journey Maskats took to the Tsminda Sameba (Holy Trinity) monastery in the Caucasus Mountains in Georgia. The nearly twelve minute work, which includes many elements of reverence and awe, builds in intensity as it reaches its thunderous conclusion, and Andrejs provides a memorable and engaging performance of this mountainous musical landscape. Andrejs Osokins concludes the album with a collection of works by the founder of Latvian classical music, Jāzeps Vītols. These provide for a lyrical and beautiful musical journey, from the tender lullabies ‘Dusi saldi, mans bērns’ and ‘Šūpļa dziesma’, to the colorful imagery in ‘Viļņu dziesma’, where Vītols describes the waves by his summer home in Pabaži on the coast of the Gulf of Rīga, both majestic and tempestuous, and Andrejs makes this scene come alive in his performance. All three Osokins – Sergejs, Andrejs, and Georgijs, have come together to create an immensely satisfying and enjoyable collection of piano works by Latvian composers on The Three Osokins in Latvian Piano Music. Spanning more than a century, these pieces allow the listener to travel throughout Latvian musical history, from the early 20th century to today. The performances reveal the many facets and features of Latvian piano music, from the serene to the stormy, from the hopeful to the resigned. All three of the Osokins vividly display their talents for interpretation and performance, and confirm not only their own abilities, but also the rich and abundant treasures that can be found in Latvian piano music. For further information, please visit the Skani website. With his keen sense of melody and harmony, as well as the ability to create captivating and absorbing choir works, it is no surprise that Latvian composer Ēriks Ešenvalds’ compositions have delighted and enchanted both listeners and performers worldwide. Beyond simply including his works in their repertoires, many choirs also have begun recording his works. One such example is the Portland State Chamber Choir, conducted by Ethan Sperry, who recorded an album of Ešenvalds’ compositions entitled The Doors of Heaven. Released in 2017 on the Naxos label, the CD contains four Ešenvalds choir compositions, including the larger opus ‘Passion and Resurrection’. Ešenvalds has often been inspired by the legends of various cultures, and, on a journey to Greenland, he learned of the Inuit legend of Raven, a being who created the world, but also brought destruction to it. The work is less a song but more a story in musical form, as it retells the legend through the voices and singing of the choir. Aided by traditional instruments and singing, the choir weaves a vivid and evocative retelling of the story, particularly the thunderous and tragic ending. Many of Ešenvalds’ journeys were specifically associated with researching the Northern Lights phenomenon, and this has been another major source of inspiration for the composer. One such work is ‘Rivers of Light’, a composition that combines Sami Scandinavian melodies with quotes from British explorers who were seeing the Northern Lights for the first time. Ešenvalds fuses these two visions into one cohesive, flowing whole, and the choir brings forth both aspects in the works, especially the wonder of the explorers. One of Ešenvalds’ most popular and best known works, ‘A Drop in the Ocean’, has been performed and recorded by many choirs (such as the youth choir Kamēr…, as well as the Latvian Radio Choir, to name but a few). This work, based in part on writings by Mother Theresa, is a deeply spiritual composition, but also a work of great humility, as Theresa wrote that all her work was ‘nothing but a drop in the ocean’. Beginning with the Lord’s prayer, then continuing with one of St. Francis of Assisi’s prayers and sections of Psalm 55, and concluding with Mother Theresa’s writings, Ešenvalds creates a work that is at times full of peace, but also has moments of harshness, and the choir adroitly reveals all of these musical elements. The CD concludes with the four part oratorio ‘Passion and Resurrection’, and the choir is joined by the Portland State University String Ensemble. Combining elements from a number of different sacred texts, Ešenvalds has created a unique interpretation of the story of Jesus’ crucifixion and resurrection. Soprano Hannah Consenz gives a memorable performance, including the expression of sins as taken from the Byzantine Liturgy, which is then balanced by the choir singing about forgiveness. Ešenvalds’ music for the actual crucifixion is harrowing and terrifying, as the intensity builds and climaxes with the choir repeatedly singing ‘crucify’ in harsh and almost violent tones as the string ensemble erupts in an explosion of sound. The work concludes on a meditative note, with the choir and soprano alternating ‘Mariam’ and ‘Rabboni’. Ešenvalds fans would also be well advised to seek out the CD Wandering Heart (2016) recorded by the Choir Leoni (Eric Lichte, Artistic director), as that album also has some of Ešenvalds works for men’s chorus (including world premiere recordings of men’s choral arrangements of some of his best known works such as ‘Stars’ and ‘Long Road’, as well as the first recording of his cycle ‘Wandering Heart’ with lyrics by the late Canadian songwriter Leonard Cohen). 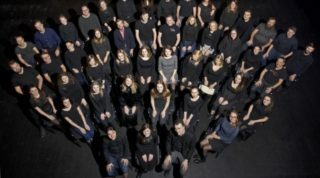 The Portland State Chamber Choir’s The Doors of Heaven is yet another testament of Ēriks Ešenvalds singular ability and talent to compose choir compositions that resonate with choirs and listeners all over the world. The CD will be of interest both to those well familiar with Ešenvalds’ works, as well as those discovering them for the first time. In the hands of conductor Ethan Sperry, these performances are given lives of their own, which is appropriate, considering that many of the works are retelling of stories and legends. The Doors of Heaven is both an excellent recording and a document of Ešenvalds’ compositional skills and abilities. For further information, please visit Ēriks Ešenvalds’ website, and the Portland State Chamber Choir website. Rāva, a band from Rīga, Latvia that came together in 2014, describe their style as ‘dark, experimental folk’. Using extensive sound effects and synthesizers, as well as traditional instruments, their interpretations of Latvian folk songs tend towards the solemn and weighty, and their live performances are also enhanced by performance art elements. 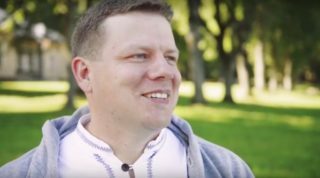 This approach to Latvian folk music, while unique, is perhaps not at all surprising, considering the nature of many Latvian folk songs. A significant number are sad, if not tragic, with their tales of death, war, orphans, as well as life’s difficulties. The group released their self-titled debut album in 2018, and the songs are all almost entirely based on folk songs about war. 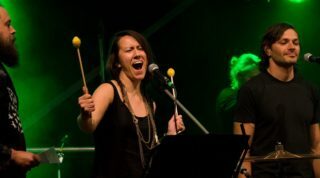 The ensemble was founded by ethnomusicologist and vocalist Ilze Ceļmillere, and she is joined by guitarist and sound effects specialist Toms Ceļmillers, Emīls Zonne on vocals, mandolin and flute, as well as vocalist Eduards Plankājs and Viesturs Āboltiņš on vocals and bass. Initially, this collection of songs was gathered as Ceļmillere’s thesis work, and was presented as the performance art work ‘Vārna krāca ozolā’, and later the group recorded the songs to create this album. The record begins with ‘Sniegi sniga’, a radically different interpretation of the folk song that inspired the popular song ‘Zibsnī zvaigznes aiz Daugavas’ (arranged by composer Jānis Lūsens and originally performed by singer Mirdza Zīvere in the mid-1980s). While Lūsēns’ version was a sweet and tender song, Rāva present it more as an ominous, fatalistic song about war approaching, with Ceļmillere intoning the words over sound effects and a slow bass line to enhance the feeling of dread. As the songs on the album are about war, this may remind listeners of a similar album Dzelzīm dzimu by the ensemble Vilki, which also contained war songs. Both albums feature interpretations of the song ‘Vīri, vīri, nebūs labi’ (on the Rāva album it is called ‘Vārna krāca ozolā’). Rāva’s version of this song about preparing for war is melodic, with the band members providing harmonies over arpeggiated chords, with a bit of discordance at the end, provided by the flute and guitar. The album moves more towards the area of sound and performance art with the track ‘In Memoriam’, which does not include any vocals, but is based around a recording of former Latvian Legion member Laimonis Ludzenieks (who passed away in 2017, and this song is dedicated to his memory). Against a backdrop of unsettling sound effects, Ludzenieks tells of his quite terrifying personal experiences in battle, as well as foreboding dreams and visions he had during the conflict, including one where his mother comes to him to warn him of the difficult day he will have. Over a sparse accompaniment Rāva create a heartbreaking vision of the song ‘Uz kariņu’, a song that is also about departing for war, as the soldier turns around to see all his family members crying, and the finality and despondency of all those involved is expressed in Rāva’s performance. On their debut album, Rāva, with their dark and experimental interpretations of Latvian folk songs about war, have woven together an engaging and thought provoking album. Using sounds effects and many dim and shadowy musical colors and textures, the group has created a record that, while truly dark and even bleak at times, is still quite affecting and moving. Of course, not everyone may enjoy this collection of songs due to their weighty nature and dark atmosphere. Many of the songs, with their slow, deliberate pace, may remind some of funeral dirges. Still, Rāva have indicated that this record concludes their exploration of war themes, and will explore other Latvian folk themes in the future. Rāva’s interpretations of folk songs about war will remind the listener of the tragic toll that war has taken on Latvia throughout the centuries, as well as the grim reality of conflict, and this is richly reflected in Rāva’s performances. For further information, please visit the Rāva Facebook page.